Pamama Esmeralda has taken first place in every Best of Panama competition it has been in, and once again, this year is no different. Last years crop commanded $53 per pound green; this years first place offering went for $130 per pound. Yes One-Hundred-and- Thirty Dollars per pound green! Is this coffee worth it? In a word, yes. You can see the final auction results here. While there is a huge gap between this coffee and the others in the competition, the limited offering (just 500 pounds) and the brilliance in the cup created fierce competition for this remarkable coffee. 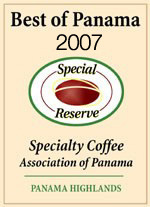 We will all wait with giddy anticipation to see what the auction winners have planned for this years Panama Esmeralda.